This entry was posted on Tuesday, November 5th, 2013 at 12:32 pm and is filed under Australian Cities, Brisbane, Melbourne, Sydney, Urban density, Urban Planning. You can follow any responses to this entry through the RSS 2.0 feed. You can leave a response, or trackback from your own site. 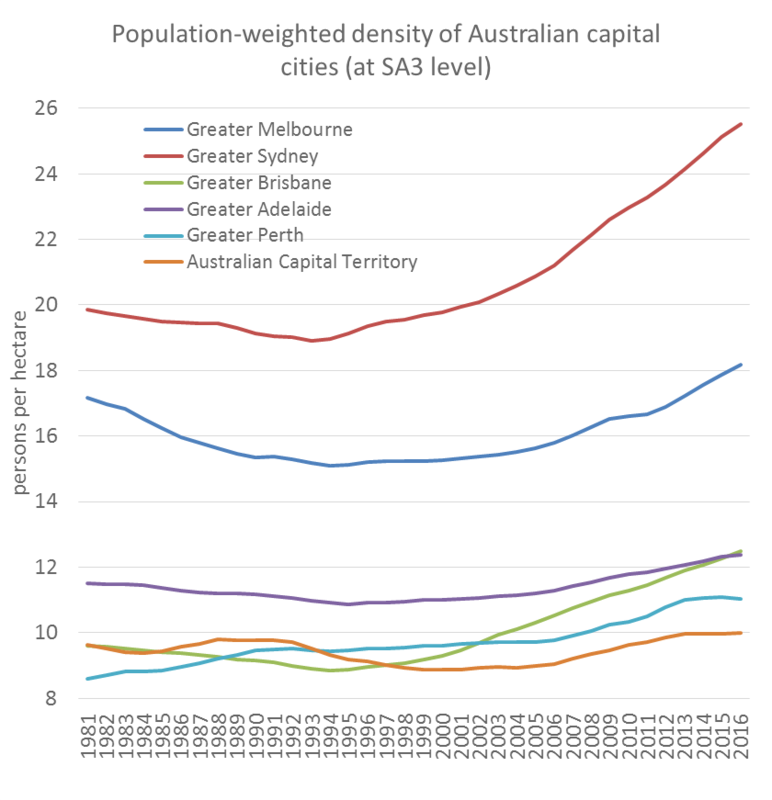 3 Responses to Are Australian cities becoming denser? Thanks Chris. I’ve been pondering this notion of population-weighted density for a while, and specifically the way it gives different measures depending on the scale of the land parcels used to calculate it. where PWD is population-weighted density, DWP is density-weighted population, and GA is gross area (the total area of all the land parcels put together). What this immediately tells us is that while PWD has the units of persons per hectare, the ‘persons’ are actually density-weighted. This explains why PWD changes when you take the same gross area and divide it into different sized parcels. For example, if you split an area into just two parcels A and B it’s possible that A could have twice the density of the overall area and B just half the density; then for PWD each resident of A counts as 2 while each resident of B counts as 1/2. If A and B actually have the same population, then DWP is 1.25 times the original population; if A has twice the population of B then DWP is 1.5 times the original population. Since the gross area is unchanged, these increases in DWP pass straight through to increases in PWD. 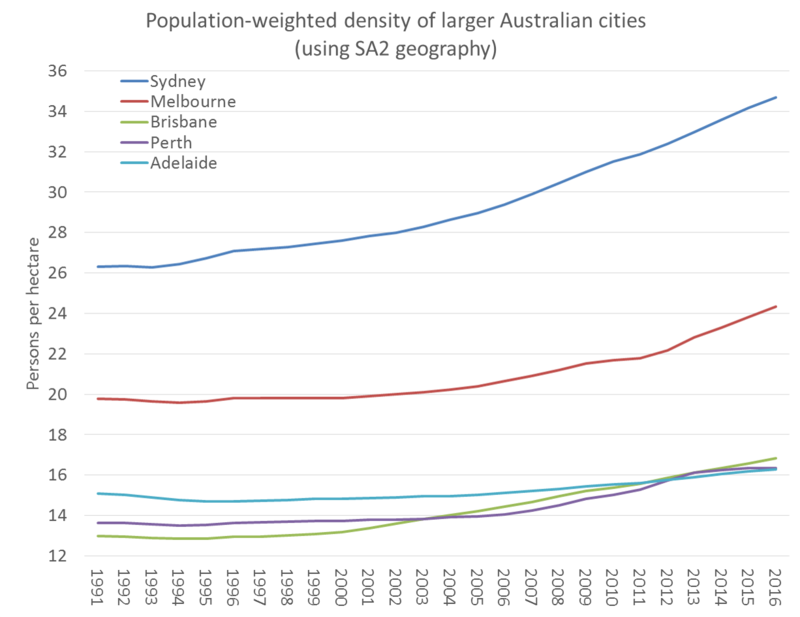 In general, the more variation in density there is across a specific region, the greater will be the increase in DWP and hence PWD when you split the region into smaller parcels. Conversely, if a region is absolutely uniform in density then DWP, hence PWD, will not increase at all under subdivision. PWD = (P1 / GP) (P1 / A1) + (P2 / GP) (P2 / A2) + …. DWP = P1 (P1 / A1) / (GP / GA) + P2 (P2 / A2) / (GP / GA) + …. = P1 (P1 / A1) (GA / GP) + P2 (P2 / A2) (GA / GP) + …. = P1 (P1 / A1) / GP + P2 (P2 / A2) / GP + …. = (P1 / GP) (P1 / A1) + (P2 / GP) (P2 / A2) + …. This shows in particular that the ratio of PWD to the ordinary overall density (GP / GA) is identical to the ratio of DWP to the ordinary population GP. 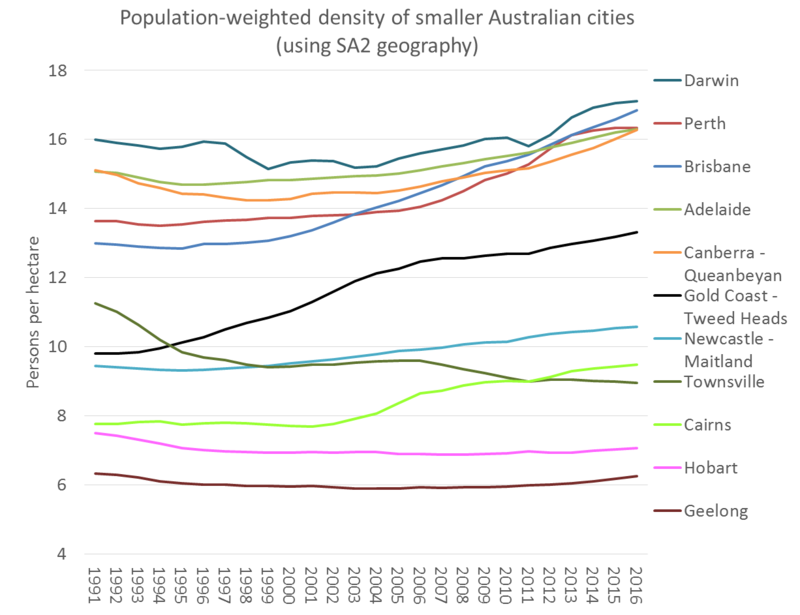 I am a historian interested in plotting changes in density over the long-term. Your excellent population gradient graphs and maps could be compared with those generated long ago by Max Neutze in his Urban Development in Australia 1977. I wonder if your overlaid your graphs on his, assuming that the statistical bases are common? You have taken some trouble to remove the effects of factors such as water (in Sydney particularly) so I’m not sure whether your density per hectare figures are directly comparable to Max’s. Hi Graeme, I’ve managed to get a copy of Max’s book. It must have been quite a feat to do calculations of density in those days. 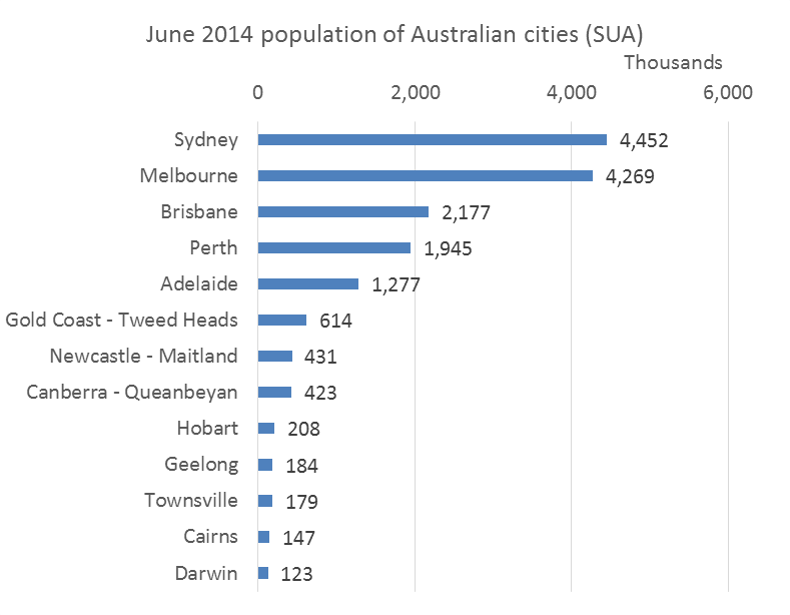 He’s got charts of residential, urban, and population density by distance from the GPO for Sydney, Perth, and Adelaide. 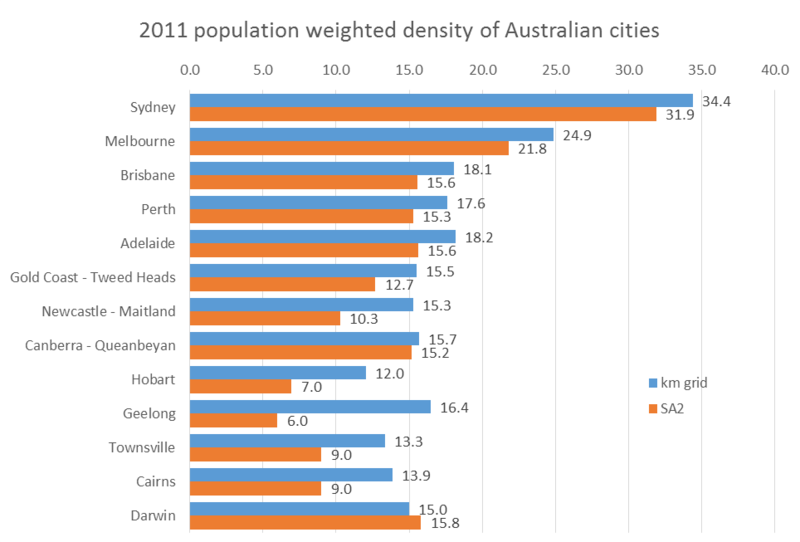 My published charts have used population-weighted density, which is quite different to residential density. 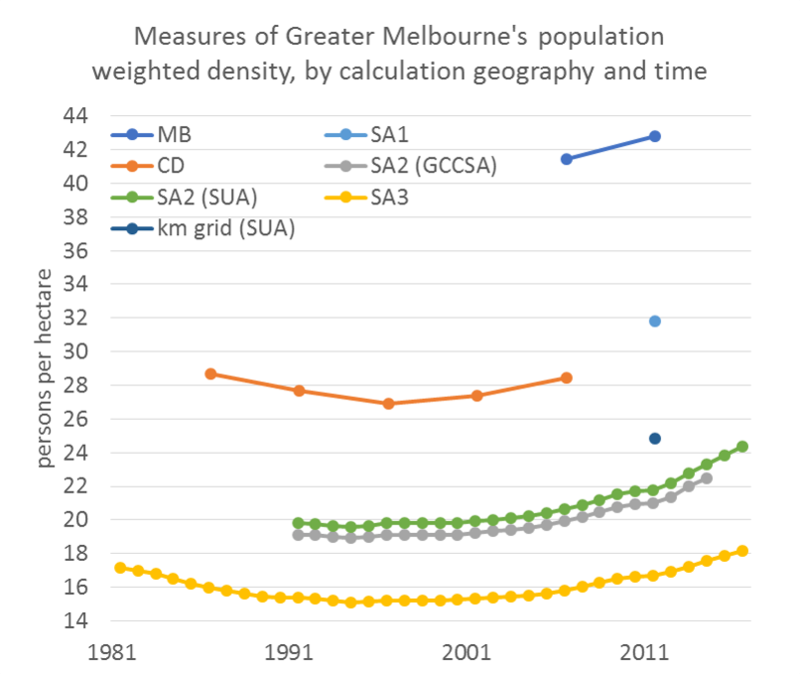 It would be possible to calculate residential density by distance from the CBD for the 2016 and 2011 censuses using mesh blocks for a definition of residential land. However there’s no guarantee that would be a comparable approach to what was used for those calculations in the 1960s and 70s (you’d have to hunt down Max’s sources), but you could at least compare the shape of the profiles.